This activity is related to a Teachable Moment from Aug. 23, 2016. See "Back-to-School Burn: The Science of Wildfires." 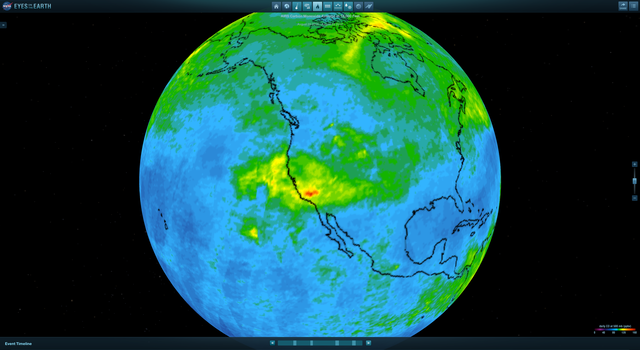 In this activity, students learn how scientists assess wildfires using remote sensing. Students then use some of the same techniques to solve grade-level appropriate math problems. Younger students will be able to do the first five problems of the problem set (Procedures Steps 1 through 5, or Page 1 of the Student Worksheet). Focus on helping them understand the difference between a true-color image and a false-color image, in which we use "not-true" colors to make features stand out better to our eyes. Show examples. For clarity, show the ground-truth images from the high school problems (Steps 9 through 11) that show what the ground area looks like for the aerial view they are seeing. Ask which image coloring helps us see the bigger picture of how much the fire has affected an area. Ask which map helps us see the effects better. Use physical or electronic math tiles or tangrams to find the area of the fire. If using physical tiles, enlarge the image to match the size of your classroom tile set. Middle grades students will be able to do problems 1 through 7 of the problem set (Procedures Steps 1 through 7, or Page 1 of the Student Worksheet). Encourage them to either use a grid or piecing polygons to estimate area. High school students will be able to do all the problems (Procedures Steps 1 through 13, or Pages 1 and 2 of the Student Worksheet) as long as they have access to Google Earth. Wildfire is a global reality, and with the onset of climate change, the number of yearly wildfires is increasing. 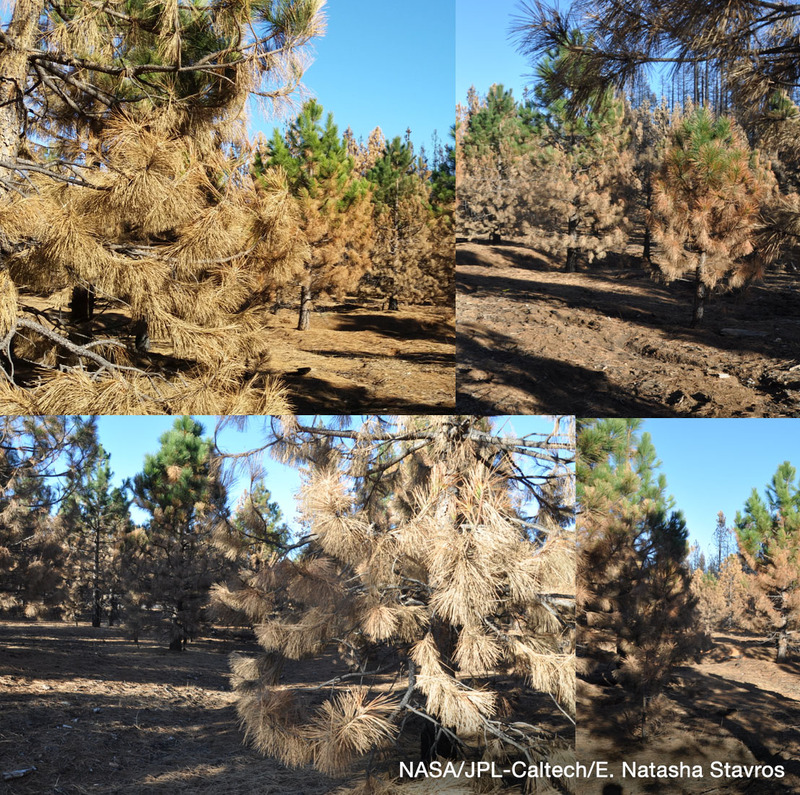 The impacts of wildfires range from the immediate and tangible to the delayed and less obvious. The potential for loss of life, property and natural areas is one of the first threats that wildfires pose. From a financial standpoint, fires can lead to a downturn in local economies due to loss of tourism and business, high costs related to infrastructure restoration, and impacts to federal and state budgets. Measuring the effects of wildfires takes many forms, several of which use remote-sensing technologies. 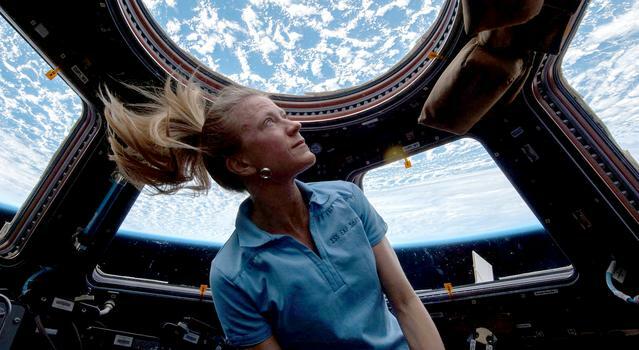 Remote sensing, observing and measuring an object without coming into contact with it, is performed by instruments on board NASA aircraft and satellites. These instruments measure the radiation being emitted by or reflected off of an object, whether it's radio waves, visible-light waves or energy from another part of the electromagnetic spectrum. Infrared imagery is particularly useful in studying wildfires during the fire and in the aftermath. 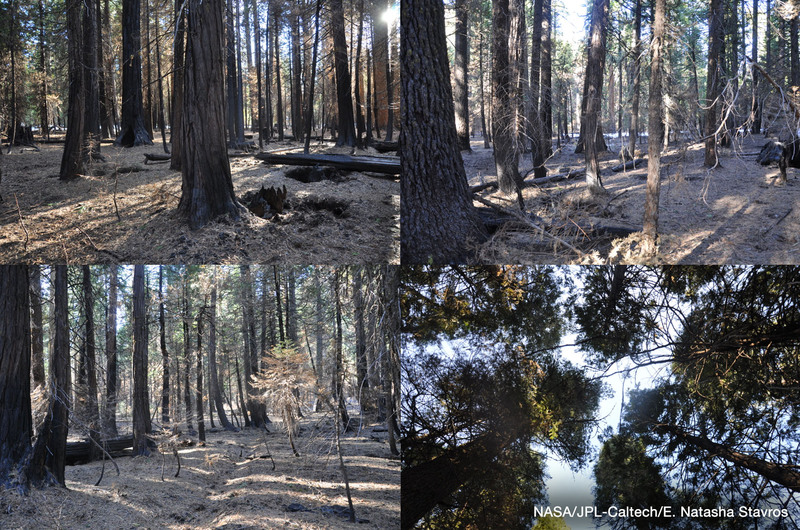 This problem-set references a few recent California fires including the 2014 King Fire, a fire NASA's Jet Propulsion Laboratory and the US Forest Service have collaboratively studied in depth. The King Fire burned more than 100,000 acres in Placer County, California, in September 2014. It was a uniquely severe fire that produced a great deal of smoke threatening global air quality. 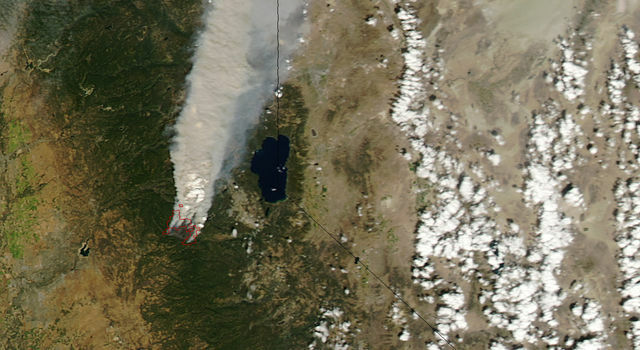 Unprecedented fire data contributing to the advancement of science was acquired by a variety of sensors including the AVIRIS instrument flying aboard NASA's ER-2 aircraft high above the King Fire; the Moderate Resolution Imaging Spectroradiometer (MODIS) flown on two satellites, Aqua and Terra; and the Operational Land Imager (OLI) aboard Landsat 8. The scorched area left after a fire is called a burn scar. A lot can be learned from burn scars. The most obvious is the amount of territory that was touched by the fire. Less obvious but more important to fire scientists is the severity of the fire. Wildfires are classified as burning at different levels of severity: low, medium and high. Severity is a function of intensity, or how hot the fire was, and its spread rate, or the linear (kilometers per hour) speed at which it travels. 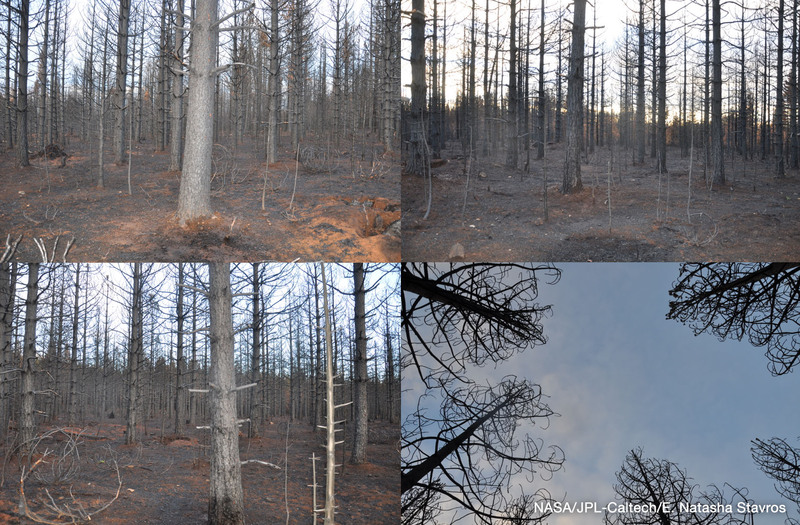 Fire severity describes how fire intensity affects an ecosystem. A high-severity fire is going to cause some irreparable damage to plant life, while a low-severity fire will be recoverable for many large trees. Severity is measured by the damage left after the fire, but can be estimated during a fire event by calculating spread rate and measuring flame height which indicates intensity. For a more thorough discussion of fire severity as it relates to fire intensity, read this paper. Satellite instruments can provide an excellent view of a large area, often at high resolution. But before an instrument is flown on a satellite, it is first tested by flying it on an aircraft and validated using data acquired by scientists who gather data on the ground in the region imaged by the instrument. Instruments go through many iterations of testing and validation before they fly on a satellite. The AVIRIS instrument that was key in informing our knowledge about the King Fire is one that's currently being tested and validated. Someday an instrument with similar capabilities as AVIRIS will fly on an Earth-orbiting satellite and provide constant data to scientists. 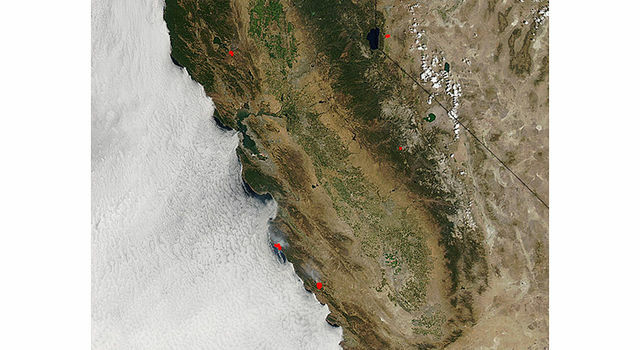 Examine the true- and false-color images for the Sand Fire and King Fire. What are the advantages of viewing a fire in true color? 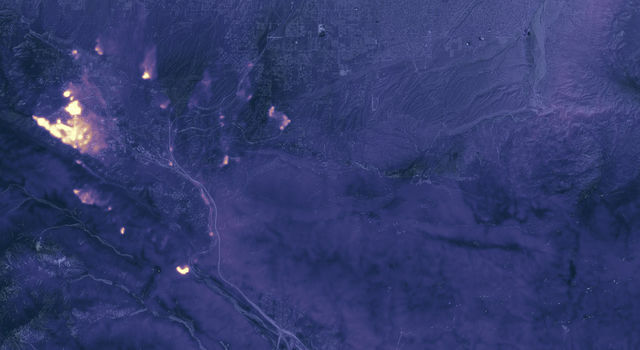 What are the advantages of viewing a fire in false color? 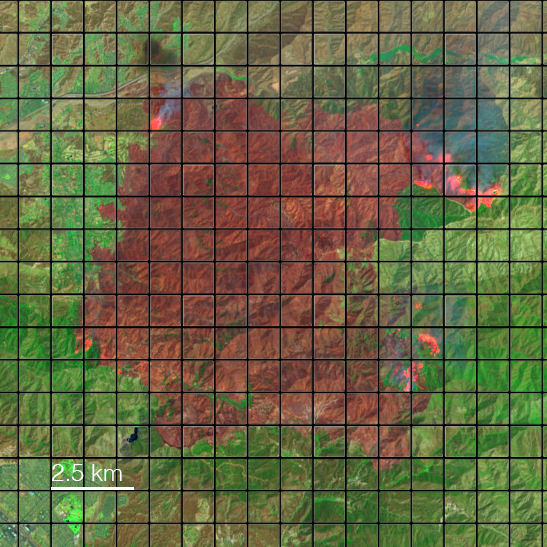 Use the scale on the false-color image of the King Fire to estimate how long, at its longest, the burn scar is. Use the King Fire progression map to estimate how long, at its longest, the burn scar is. Which is easier to use, the false-color image or the progression map? Why? How do you suppose progression maps are created? Use math tiles or a grid to find the area of the Sand Fire. Use math tiles, polygons, or formulas to find the approximate area of the King Fire burn scar. Use whichever map you find easiest. Examine the progression map for the King Fire. Assuming a constant progression rate throughout the day, how fast was the fire moving on September 15? Firefighters were on the ground fighting the King Fire as it advanced toward them. The terrain is steep and unforgiving. Firefighters are wearing and carrying a lot of heavy gear. A firefighter in full gear can climb a slope at a rate of 3.2 kph. If a firefighter were working the King Fire on the front lines on September 13 as the fire advanced, would they have time to outrun it or would they have to shelter in place? Open Google Earth and embed the King Fire severity data set KMZ file. Green areas are unchanged by the fire. Yellow equals low severity; orange equals moderate severity; red equals high severity. Note: The King Fire was an unusually severe fire. Find this location on the map: 38.878872, -120.572015. Is this in an unchanged, low, moderate, or high severity location? Check out these images taken at this location on the ground. Find this location on the map: 38.832171, -120.492246. Is this in an unchanged, low, moderate, or high severity location? Check out these images taken at this location on the ground. Find this location on the map: 38.808761, -120.475796. Is this in an unchanged, low, moderate, or high severity location? Check out these images taken at this location on the ground. Discuss how you made your decisions for your answers to questions 10 and 11. Hypothesize about why aerial or satellite data would give ambiguous information. For younger students, discuss a "bird's-eye" view versus the view on the ground. Use Google Earth to show them the playground at their school and the front of the school from above. Help them navigate, from an aerial perspective, various trips they take during the day, from arrival, to the classroom, to recess, to lunch, etc. For older students, discuss the relationship between false-color imagery and the electromagnetic spectrum. Most scientific false-color images are created by using imagery in a portion of the electromagnetic spectrum other than the visible. The false-color images of burn scars are often created using infrared sensing cameras. Students should be able to do the problems that are appropriate for their grade level. For younger and middle-grades students who are kinesthetic learners, be sure to allow the use of math tiles or similar manipulatives and assess their understanding using those methods. Understand the concept of a unit rate a/b associated with a ratio a:b with b ≠ 0, and use rate language in the context of a ratio relationship. For example, "This recipe has a ratio of 3 cups of flour to 4 cups of sugar, so there is 3/4 cup of flour for each cup of sugar." "We paid $75 for 15 hamburgers, which is a rate of $5 per hamburger."